Newton, NJ – November 4, 2016 – Thorlabs has announced the release of its EXULUS-HD1, reflective two-dimensional spatial light modulator (SLM) based on liquid crystal on silicon (LCoS) technology. The Exulus® SLM provides high-resolution, high-speed phase modulation with minimal fluctuations, making it ideal for use in a wide range of applications such as optical trapping, beam steering and shaping, femtosecond pulse shaping, adaptive optics, display and imaging, and holography. Figure 1. The EXULUS-HD1 SLM is provided with a magnetic cover; when in use, the cover can be attached to either side of the housing as shown here. 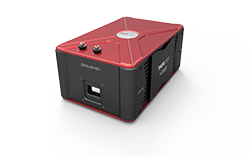 The EXULUS-HD1 includes a built-in SLM panel with 1920 x 1080 resolution, 6.4 µm pixel pitch, 93% fill factor and a 12.5 mm x 7.1 mm active area. With operation from 400 nm to 850 nm, it offers a phase stroke of 2p at 633 nm (standard mode) and 5.7p at 532 nm (extended mode). The EXULUS-HD1 is driven by a standard digital video interface (HDMI) signal and provides a refresh rate of 60 Hz in standard mode and 180 Hz in the frame boost mode. 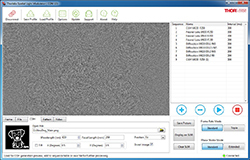 The industry-leading configuration parameters and easy-to-use software interface facilitate the outstanding performance of diversified applications ranging from stand-alone functions to integrated research-grade systems. The EXULUS-HD1 is bundled with a software graphical user interface (GUI) that provides complete control over the device and supports different driving modes including full frame, image input, video input, Fresnel lens, diffraction, and computer-generated holography (CGH). The CGH mode also allows tilting and focusing effects to be superimposed onto a pattern to achieve combined functionalities. Figure 2. The computer-generated holography (CGH) pattern generated by the Exulus® software based on a user-supplied image. The built-in SLM panel provides independent horizontal and vertical tilt adjustment of ±3.2°. Highly flexible customized versions of the Exulus® with the panel separated from the control unit are also available upon request. In addition, the 4K resolution (3840 x 2160) version will be released late 2016. The Exulus® SLM is founded on Thorlabs’ liquid crystal (LC) capabilities and years of R&D experience, providing users with high-quality LC products and all-around technical support. With the expansion of R&D and production capacity, new LC product lines are in development. A complete collection of the LC products can be found at www.thorlabs.com/LiquidCrystal. For additional details on the Exulus® Reflective Two-Dimensional Spatial Light Modulator, please visit www.thorlabs.com/SLM.